Actress and singer Mandy Moore recently renovated her mid-century home in Pasadena, and the results? A stunning home that shines from the inside out. Without sounding stalker-ish, I’m completely obsessed with Mandy Moore’s mid-century home! Ooh, I’ve got a crush on you... the home that is! Originally built in 1950 by mid-century modernist Harold B Zook, the home took an unfortunate renovation in the 1990s which completely messed with the home’s original mid-century integrity. Interior architect Emily Farnham came to the rescue with the aide of interior designer Sarah Sherman Samuel and well, the restults speak for themselves – a breakthtaking home high atop a Pasadena hill that takes in the sweeping vista of the San Gabriel mountains and valley. When can I move in? Check out the video below too for the tour! Check out Sarah Sherman Samuel’s blog for more images and details of Mandy’s home by clicking here. And see the feature from Architectural Digest by clicking here. Aura Home have released their stunning new Inca range in time for spring. We also take a look at their gorgeous range of furnishings and decor. Aura Home’s new Inca design is a circular display of abstract geometry in luscious pink clay and black. Their bedding is made from the highest quality natural cotton sateen, finished off with matching piping trim. Available in quilt cover sets, complete with two standard pillowcases, and european pillowcases. Also available is a stunning new collection of jacquard towels in black, dove and pink clay. Like all of Aura Home’s luxuriously soft and absorbent pure cotton towels, they are available in bath sheets, bath towels, bath mats and hand towels. The hardest part will be deciding which colour to go with! Aura Home have long been leaders in the bedding and textile industry, but did you know they also now stock a select range of bedroom furniture and decor? You can pretty much use Aura Home as a one-stop-shop to completely transform your bedroom with beautiful bedheads, side tables, pendant lights and even a delectable array of on-trend art prints. The Seed woven leather bedhead (pictured above), paired with their Maison Fringe linen in clay is the stuff dreams are made of! We’re also fans of the Vittoria linen slipcover bedhead available in smoke (pictured above) and milk (pictured below). What’s so great about this style is that it could easily fit in with so many decorating styles – from relaxed coastal, to modern farmhouse to simple Scandi. And then of course paired with some of Aura Home’s dreamy linen, it’s a perfect match. For those of you lucky enough to live in Melbourne, you can visit Aura Home’s first concept store located on Malvern Rd, Malvern. The beautifully refurbished, heritage-listed building features a series of individual room spaces, impeccably styled by the Aura Home team. Or you can simply shop the range online by clicking here. Looking for a new rug? It can be tricky selecting the perfect one – we’ve rounded up a few of our favourites for the living room, bedroom and kids’ rooms. Plus a few handy hints for what to be looking for. I love a good fluffy wool rug – they’re so soft underfoot so are a great option for living rooms. This Kasbah rug from West Elm (pictured above) is just one example of their great range of Morrocan-inspired wool rugs – I have this one in my own living room and love it! 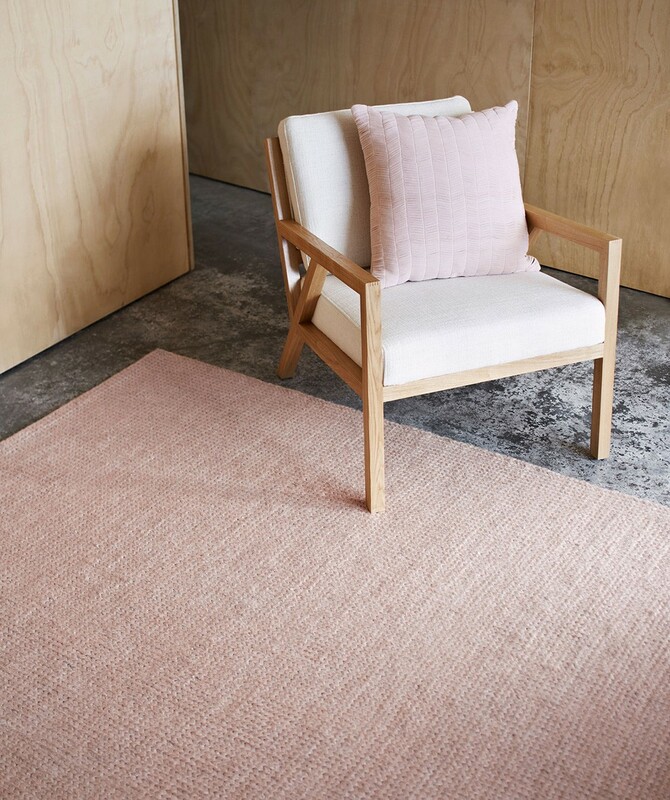 If super neutral is your thing, yet you want some subtle pattern and texture, the Cesar rug from Tribe Home (pictured at the very top of blog post) is a superb option. I can attest to their quality too, owning one of their rugs in my own home. 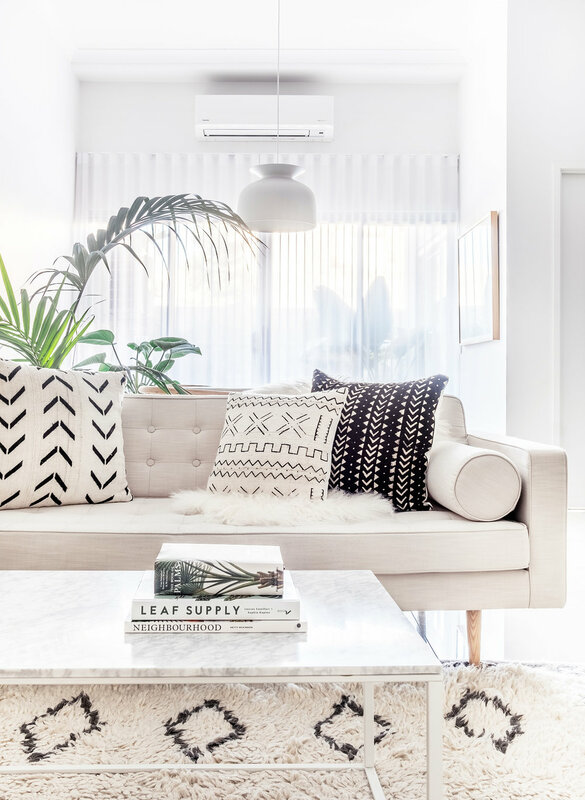 A word of warning – a white rug in a high-traffic zone such as a living room won’t work for everyone - this rug would also be a great option for a low-traffic room such as a bedroom. 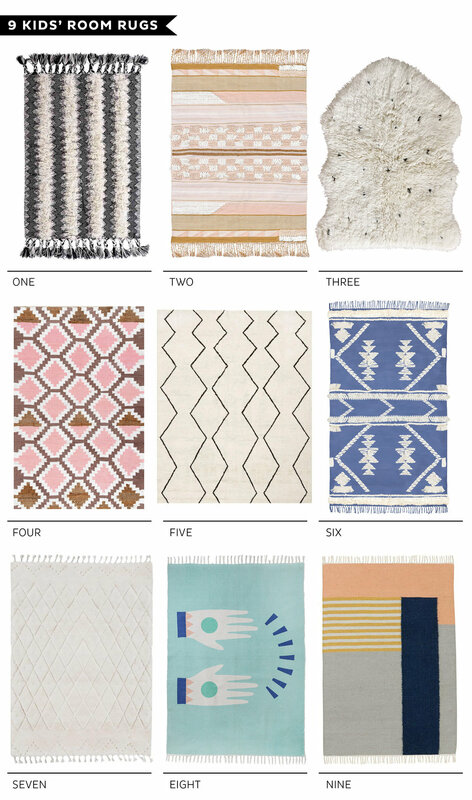 Amigos De Hoy have a delightful range of boho-inspired rugs. Their Hawkwind rug pictured opposite is at a great price point too - the 2 x 3m size is only $499. In my opinion you wouldn’t want to go much smaller than a 2 x 3m rug in a living room – bigger is usually always better for this zone. When it comes to selecting a rug for the bedroom think about going for something more textured and soft. Because the bedroom is a low-traffic zone, you can go for thicker, plusher and even lighter colours because there’s not as much foot traffic. Plus there’s nothing nicer than getting out of bed in the morning and feeling the softness underfoot. I adore the colours and fringe tassels on this vintage inspired Tembo cotton rug from Amigos De Hoy (pictured above). In terms of rug placement, Jonno Rodd from Hunting For George suggests for a more luxurious look, to place a large rug underneath the bed with a generous amount visible at the foot and sides. “Keep bedside tables off the rug to highlight the floor and enhance the feeling of space. We recommend something with a beautifully soft texture like the Armadillo&Co Sierra Weave, or something from the latest hand-woven collection, the Latitude Collection,” says Jonno. 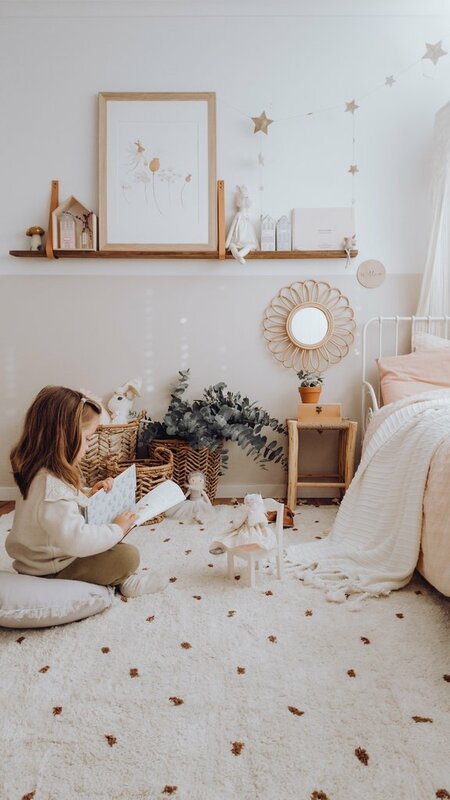 When it comes to deciding on a rug for your child’s room, think about their age and needs. A nursery or room for a young toddler might benefit from a softer, thicker rug like this Dreamweaver wool rug from Granite Lane (pictured above). 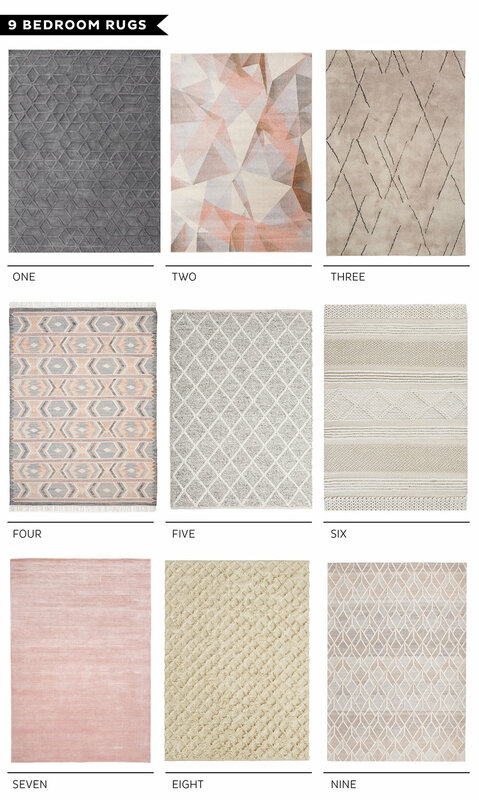 West Elm also have a new range of nursery rugs in collaboration with Pottery Barn. Their Loop rug (pictured below) is so plush and I just love the subtlety in its design. 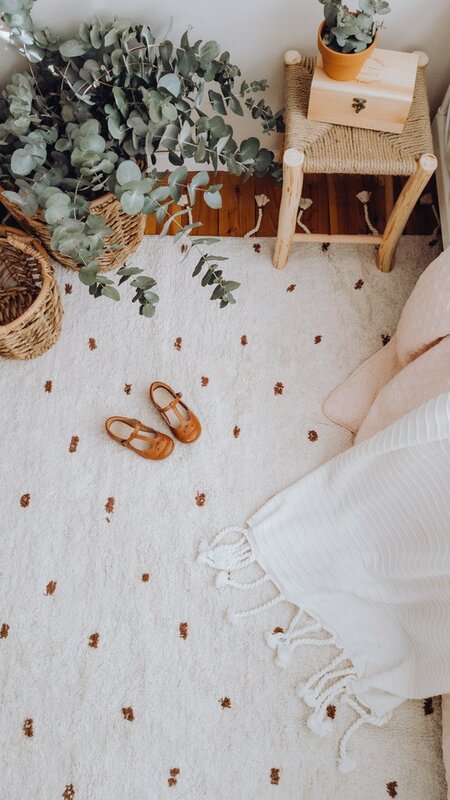 Dutch Warehouse recently collaborated with stylist Bek Halliday to create this beautiful, handmade Fawn Dot rug (pictured above). Inspired by Bek’s style and use of natural colours, the rugs work perfectly in nurseries, playrooms or even in living rooms. The rugs are super soft and are perfect for scandi boho interiors. 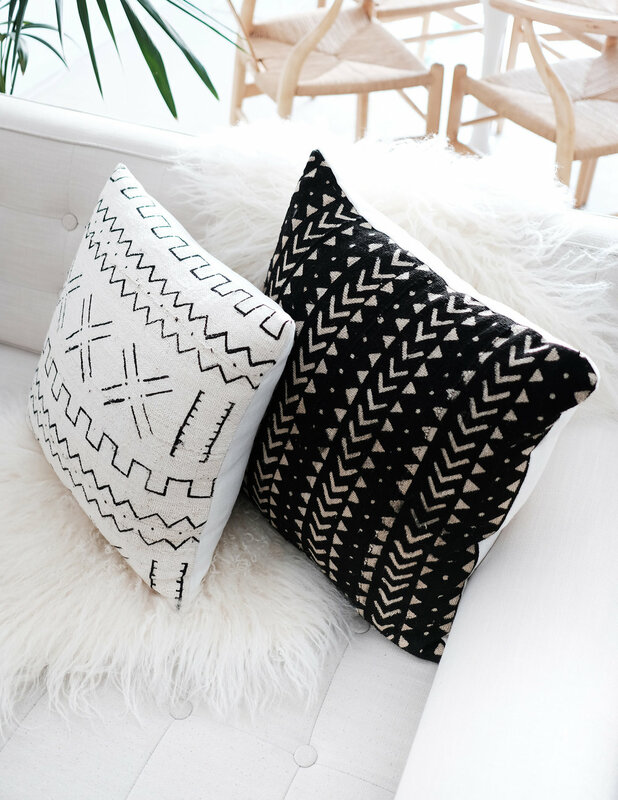 New Mudcloth Cushions in our store! 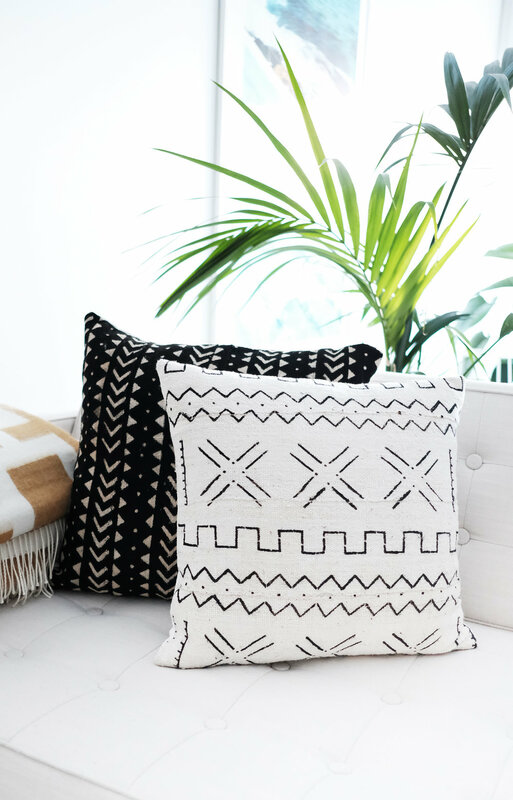 The Adore online store has four new Mudcloth cushions – with only limited quantities you’ll want to snap some up quick-sticks! I became obsessed with Mudcloth on my recent trip to California, it was literally everywhere – at one of the hotels we stayed at, a variety of shops, even restaurants! So naturally when I came across this beautiful mudcloth in the US, I decided to buy a few metres and haul it back with me to make some cushions for the Adore online shop (and maybe a few for myself too!). I just adore the way they look on my sofa. If you love them too, they’re priced from $60-$65 each – this is for the cushion cover only - you’ll need to purchase your own inserts – Spotlight or Innergreen (online store) are great places to find affordably priced inserts. If you’re not familiar with it, African mudcloth is a traditional Malian fabric that is dyed with fermented mud and plant dyes and then hand sewn in strips. Mudcloth can be washed in cold water. We recommend using a gentle soap and hand-washing, then airing out to dry flat on a clothesline (don’t tumble dry). Concrete looks right at home in the kitchen, when sealed properly it can be a highly functional and durable surface to work on. The Concrete Nation team handcrafted the bespoke kitchen island bench top and splash back pictured above. We adore this luxe, moody kitchen which incorporates simple, dark cabinetry and polished concrete with reclaimed solid Blackbutt timber paneling to add warmth. Below is another bench top created by Concrete Nation. We’re also a fan of the concrete panels on the walls and the polished concrete floor – the look is very contemporary with a hint of industrial flavour. We’re crushing hard on this elegant kitchen below – the perfect mix of marble, concrete and white cabinetry. Put this kitchen by Madeleine Blanchfield on our future dream house wish list! I just adore everything about this kitchen, from the concrete floors through to the exposed beams on the ceiling – it's utter industrial perfection. And whilst there is a lot of concrete in the space, it doesn't feel heavy or cold. The simple design trick? Balance with a whole lot of white and timber cabinetry! Concrete sinks are one of the biggest trends to emerge in bathrooms over the past couple of years. And for good reason – the humble white porcelain sink has become a bit ho-hum. Adding a touch of concrete to your bathroom can add a slight industrial edge or a pop of colour if you opt for something like these Nood Co. bowl basins (pictured above) in Nat from Norsu Interiors’ home. If something more neutral is your style perhaps Nood Co.’s box basin in a mid grey tone will be more up your alley (pictured below). Concrete Nation also have some amazing bathroom sink options – their Pod Basin (pictured above) looks great pictured here with exposed plumbing – this type of setup would work well in a powder room. If you’re feeling more courageous – what about a pink sink? Yep Concrete Nation also offer coloured sinks in nine on-trend colours. Their dusty pink Lux Basin is pictured below in the home of Kayla Boyd (and featured in our Escape edition). The concrete benchtop is also courtesy of Concrete Nation – gorgeous right?! They even offer concrete baths (pictured bottom) – their Oasis Bath is pretty special. The colour pink is back in a huge way, dubbed 'Millennial Pink', the blush pink shade is popping up everywhere, from painted walls, to soft furnishings and yes, even in bathrooms. Go bold with pink tiles, or for a safer pop of colour, opt for a pink concrete sink. If you tire of the colour in a few years, simply replace (much cheaper than replacing tiles!). If a bathroom or kitchen renovation isn’t on the cards any time soon, and you want a bit of concrete in your life – there’s a whole array of concrete homewares and furniture. It’s super popular at the moment, you’ll find almost everything with a splash of concrete - from lighting, to tables, to pots. The Sculpt range of pendant lights from Beacon Lighting (pictured above) have a lovely Scandi vibe. Cluster together over a dining table or use individually in a bedroom for subtle lighting. Harpers Project also make a super luxe range of furniture with the addition of concrete. I can’t get enough of their dining table options – their Rectangle Concrete Dining Table (pictured above) is supported by a beautiful and strong solid timber frame. Again the pairing of concrete with timber just works so well. And pictured to the right, Harpers Project’s round Concrete Cylinder Dining Table features an American Oak top supported by a sturdy concrete base. Concrete also looks amazing with fresh greenery – so when we spied this pair of Tower pots from Zakkia (pictured below) we had to share with you! These are actually made from fibre glass, yet they look like concrete. They are lightweight so you’ll easily be able to move these around your home. Following their iconic AW18 release comes Urban Road’s stunning new collection for Spring Summer 2018 - Reminisce. Since its foundation in 2010, Urban Road has worked hard at its mission to bring high-quality art prints to everyday art-lovers, Australia wide. By constantly expanding and evolving to accommodate for current trends, Urban Road has cemented themselves as industry-leading art professionals. With beautiful and elegant colour palettes, unique designs and uplifting imagery, Urban Road’s new Reminisce collection of artworks are easy-to-match with both contemporary and traditional decor. Finding inspiration in the natural wonder of the Australian landscape you’ll find art with themes such as blurred mountain ranges, native flora, starlit skies, sleepy seashores and sunburned landscapes. Shop Urban Road’s new Reminisce collection by clicking here.